Does your office space need more space? As companies grow and develop, what was once a giant space for work can slowly become a crammed office that needs de-cluttering and organization. Document storage can be one of the leading reasons why an office lacks space. Keep reading to learn more about how SMARTBOX can help you with your document storage dilemmas with our storage units in Maryland, Northern Virginia, and Washington, DC. At SMARTBOX, your privacy and confidentiality are very important to us. That’s why when you decide to use our storage units for document storage, you can be guaranteed that no one without authorization will view your records. This is especially important if you choose to use SMARTBOX’s storage units in Maryland for old tax records, accounting figures and matters involving the law. At SMARTBOX, our temperature-controlled, secure storage units ensure your files will be kept safe and in the same condition as when they were originally stored. One of the most common problems offices complain about is the lack of space. As companies grow, they have more files, documents, records, and papers for a variety of operations and processes. And while many companies are on the fast track towards being paperless, there are a lot of companies that still value having a hard copy of a document. If you’re one of these companies, but struggle with finding space to store all of your files, consider SMARTBOX’s storage units in Maryland for all your document storage needs. 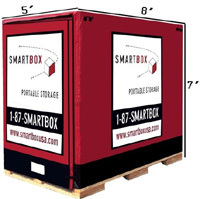 What’s great about SMARTBOX is we bring the storage to your office! No longer will you need to fret about packing everything quickly or being rushed to get everything loaded all in one day. By having the storage unit conveniently located in your office’s parking lot (our portable storage containers fit comfortably in a standard parking space), you can pack at your own pace and not worry about forgetting any important documents or being rushed to finish the job. This is even more important when you’re packing law, financial, or confidential documents. The boxes are made of a durable wood and protected by a weather-resistant cover that keeps your documents safe from the elements. When you choose document storage with SMARTBOX, we’ll always provide you with upfront pricing and quotes—there will be no surprise hidden fees or charges. If you need document storage or storage units in Maryland, Northern Virginia, or Washington DC, contact SMARTBOX to reserve your boxes today!